Park Cheong-mi is a woman of passion who seizes both the best and worst of times head on in order to achieve her dreams. Dramatic episodes in her early adult life brought about rhapsody of personal hardships, financial troubles, and difficult circumstances. However, with passion, faith, and inner strength, her life has changed tune to a joyful symphony. 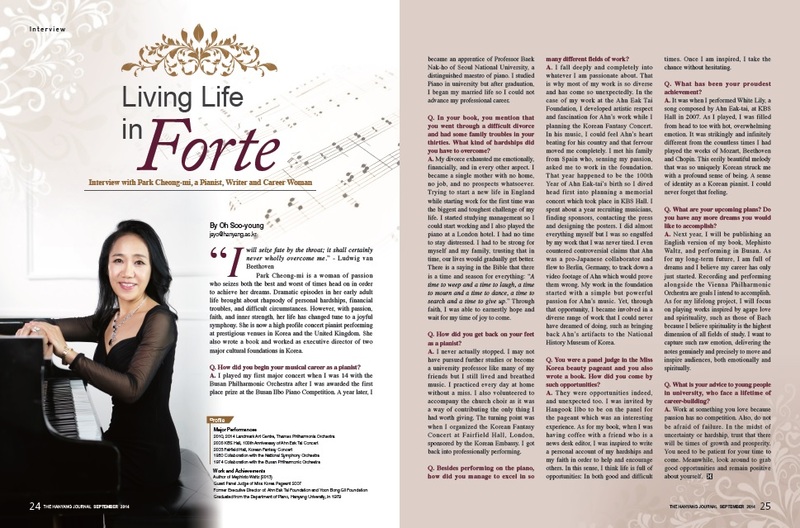 She is now a high profile concert pianist performing at prestigious venues in Korea and the United Kingdom. She also wrote a book and worked as executive director of two major cultural foundations in Korea. Q. How did you begin your musical career as a pianist? A. I played my first major concert when I was 14 with the Busan Philharmonic Orchestra after I was awarded the first place prize at the Busan Ilbo Piano Competition. A year later, I became an apprentice of Professor Baek Nak-ho of Seoul National University, a distinguished maestro of piano. I studied Piano in university but after graduation, I began my married life so I could not advance my professional career. Q. In your book, you mention that you went through a difficult divorce and had some family troubles in your thirties. What kind of hardships did you have to overcome? while starting work for the first time was the biggest and toughest challenge of my life. I started studying management so I could start working and I also played the piano at a London hotel. I had no time to stay distressed. I had to be strong for myself and my family, trusting that in time, our lives would gradually get better. There is a saying in the Bible that there is a time and season for everything: “A time to weep and a time to laugh, a time to mourn and a time to dance, a time to search and a time to give up.” Through faith, I was able to earnestly hope and wait for my time of joy to come. Q. How did you get back on your feet as a pianist? A. I never actually stopped. I may not have pursued further studies or become a university professor like many of my friends but I still lived and breathed music. I practiced every day at home without a miss. I also volunteered to accompany the church choir as it was a way of contributing the only thing I had worth giving. The turning point was when I organized the Korean Fantasy Concert at Fairfield Hall, London, sponsored by the Korean Embassy. I got back into professionally performing. Q. Besides performing on the piano, how did you manage to excel in so many different fields of work? A. I fall deeply and completely into whatever I am passionate about. That is why most of my work is so diverse and has come so unexpectedly. In the case of my work at the Ahn Eak Tai Foundation, I developed artistic respect and fascination for Ahn’s work while planning the Korean Fantasy Concert. In his music, I could feel Ahn’s heart beating for his country and that fervour moved me completely. I met his family from Spain who, sensing my passion, asked me to work in the foundation. That year happened to be the 100th Year of Ahn Eak-tai’s birth so I dived head first into planning a memorial concert which took place in KBS Hall. I spent about a year recruiting musicians, finding sponsors, contacting the press and designing the posters. I did almost everything myself but I was so engulfed by my work that I was never tired. I even countered controversial claims that Ahn was a pro-Japanese collaborator and flew to Berlin, Germany, to track down a video footage of Ahn which would prove them wrong. My work in the foundation started with a simple but powerful passion for Ahn’s music. Yet, through that opportunity, I became involved in a diverse range of work that I could never have dreamed of doing, such as bringing back Ahn’s artifacts to the National History Museum of Korea. Q. You were a panel judge in the Miss Korea beauty pageant and you also wrote a book. How did you come by such opportunities? A. They were opportunities indeed, and unexpected too. I was invited by Hangook Ilbo to be on the panel for the pageant which was an interesting experience. As for my book, when I was having coffee with a friend who is a news desk editor, I was inspired to write a personal account of my hardships and my faith in order to help and encourage others. In this sense, I think life is full of opportunities: In both good and difficult times. Once I am inspired, I take the chance without hesitating. Q. What has been your proudest achievement? A. It was when I performed White Lily, a song composed by Ahn Eak-tai, at KBS Hall in 2007. As I played, I was filled from head to toe with hot, overwhelming emotion. It was strikingly and infinitely different from the countless times I had played the works of Mozart, Beethoven and Chopin. This eerily beautiful melody that was so uniquely Korean struck me with a profound sense of being. 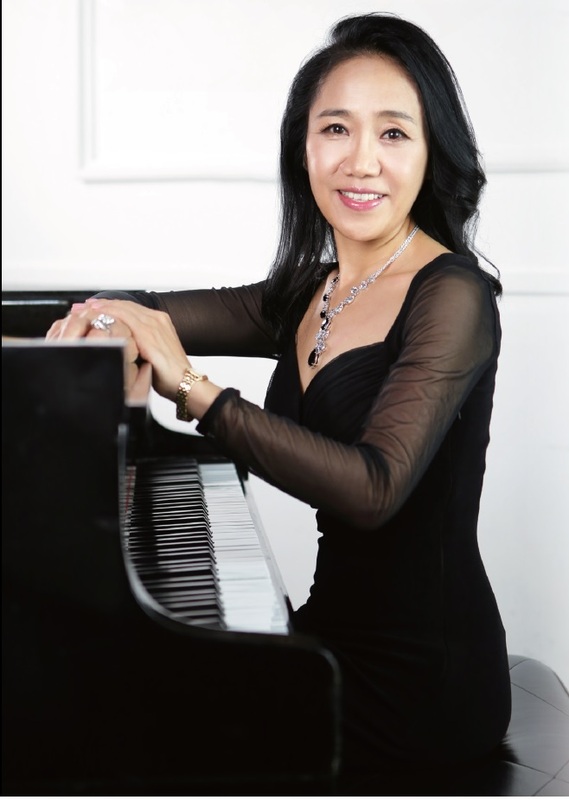 A sense of identity as a Korean pianist. I could never forget that feeling. Q. What are your upcoming plans? Do you have any more dreams you would like to accomplish? A. Next year, I will be publishing an English version of my book, Mephisto Waltz, and performing in Busan. As for my long-term future, I am full of dreams and I believe my career has only just started. Recording and performing alongside the Vienna Philharmonic Orchestra are goals I intend to accomplish. As for my lifelong project, I will focus on playing works inspired by agape love and spirituality, such as those of Bach because I believe spirituality is the highest dimension of all fields of study. I want to capture such raw emotion, delivering the notes genuinely and precisely to move and inspire audiences, both emotionally and spiritually. Q. What is your advice to young people in university, who face a lifetime of career-building? A. Work at something you love because passion has no competition. Also, do not be afraid of failure. In the midst of uncertainty or hardship, trust that there will be times of growth and prosperity. You need to be patient for your time to come. Meanwhile, look around to grab good opportunities and remain positive about yourself.